Bodhisattvas, “enlightening beings,” embody the core values of Mahayana Buddhism. The Bodhisattva ideal is what fuels a Zen practitioner’s approach to life. The talk on September 30th will answer some important questions: How did the Bodhisattva ideal emerge? What are their great vows? And, finally, who are today’s Bodhisattvas and can that include us? Rev. O’Connor was ordained as a priest in the Soto Zen tradition of Buddhism in 1994, and received dharma transmission from Tozen Akiyama in 1999, after training extensively in both Japan and the US. 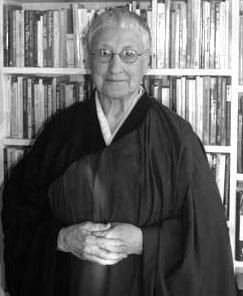 She is currently Priest Emerita at the Milwaukee Zen Center. Rev. O’Connor spent 17 years leading Buddhist programs within the state prison system and continues to work with inmates in correspondence seminars as well as being active in interfaith activities. She has two sons, four grandchildren, and six great-grandchildren.